The Chardonnay grape is thought to have originated in Lebanon, and in France Chardonnay became the only grape allowed to be grown in Chablis, Burgundy. These white Bungundy wines were well enjoyed, and the grape is also used in sparkling wines and Champagne. Chardonnay really hit its prime when it was grown in California, however. Its popularity has grown immensely in the past fourty years, to where it is now the most popular white wine available. Winemakers love Chardonnay because the vines are easy to grow, and have a high yield. Wine drinkers love Chardonnay because of the wide variety of flavours it can take on. Depending on where it's grown and how it's fermented, Chardonnay can taste semi-sweet or sour, heady or light. Typical flavors are apple, tangerine, lemon, lime, melon, and oak. Also, Chardonnay is not a "rich man's drink". A surprisingly good chardonnay can cost under $10. Chardonnay is usually dry, and goes best with poultry or seafood, like lobster or scallops. It can also perfectly accent a light red meat dish. Recommended cheeses include Gruyere, Provolone and Brie. In addition to California and Burgundy, Chardonnays are also grown in quantity in Australia, New Zealand, and South Africa. Cool-climate Chardonnays get longer growing times, and end up with subtle overtones. Warm-climate Chardonnays, on the other hand, become more flavorful and full tasting. Chardonnay should be served at 48F. Most chardonnays are meant to be drunk immediately, but some can age for 5-10 years or more. 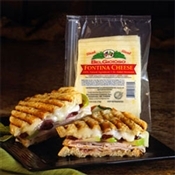 BelGioioso Four Cheese Shred is a winning combination of Asiago,Fontina,Parmesan and Provolone cheeses. With this winning combination,you can't help but sample it as you prepare your favorite meals! 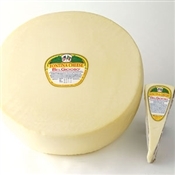 BelGioioso Fontina Cheese is the perfect table cheese with its sweet, buttery and slightly tangy flavor to accentuate any cheese presentation. Aged over 60 days, this appealing,semi-soft mild cheese has a silky texture and a sweet, buttery and slightly earthy flavor. Versatile, it melts beautifully to make excellent fondue and great-tasing quiche, but it is also a perfect choice for a cheese tray. All Wheels ordered by noon on Thursday will be ready for shipment the following Monday. Your wheel is ordered specifically for you so you may request that it is cut into 4 quarters or 2 halves in the comments section. BelGioioso Fontina is the perfect table cheese with its sweet, buttery and slightly tangy flavor to accentuate any cheese presentation. Aged over 60 days,this appealing, semi-soft mild cheese has a silky texture and a sweet, buttery and slightly earthy flavor. Versatile, it melts beautifully to make excellent fondue and great-tasing quiche, but it is also a perfect choice for a cheese tray. Aged over 60 days, this appealing,semi-soft mild cheese has a silky texture and a sweet, buttery and slightly earthy flavor. Versatile, it melts beautifully to make excellent fondue and great-tasing quiche, but it is also a perfect choice for a cheese tray. 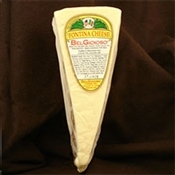 BelGioioso Fontina Cheese is the perfect table cheese with its sweet, buttery and slightly tangy flavor to accentuate any cheese presentation. Please choose Ground Shipping for this item. Items not listed with the shipping offer will be charge accordingly. All Wheels are shipped via Next Day Air during the summer months.